The following projects were submitted to TL2014.org by students of Salisbury High School English teacher, Miss Jennifer Piagesi. For my Honors English class we read the Greek plays, Oedipus and Antigone written by Sophocles. After we finished reading the two plays, we were assigned to complete a project that utilized the knowledge we gained from reading these plays. I decided to create a mask reflecting a character from Oedipus. I chose to illustrate Creon’s personality and emotion in my mask. Creon is a very wise man who often gives Oedipus words of wisdom to help lead Oedipus in the right direction. I decided to illustrate the wise attributes of Creon by using an animal that many consider to have that personality. 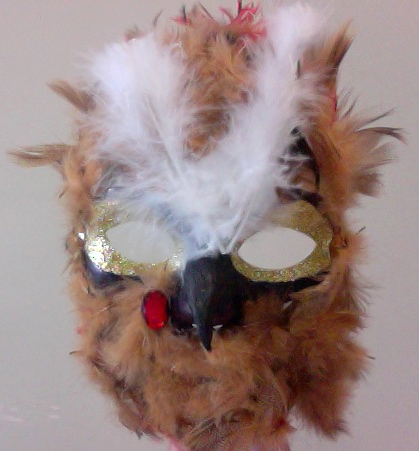 My mask is of an owl and shows Creon’s emotional aspect of his personality. The purpose of the red feathers is to infer that later on in the Oedipus plays, Creon becomes greedy and shows anger towards Oedipus’ family. Creon denies one of Oedipus’ son a proper burial because he turns against Creon and tries to become king. I chose to create my mask reflecting Creon’s character because I feel Creon reminds me of my grandfather who always leads me in the right direction. My grandfather constantly gives me words of wisdom when I am in the process of making a difficult decision. I chose to show Creon’s knowledgeable personality in my mask because for the majority of the play, Creon gives Oedipus advice on how to rule the people of Thebes. Overall, my mask displays Creon’s personality which consists of being wise. From this project I learned about the overall story of Antigone and why there was conflict between characters. This project is different because it ties in a modern family who had the same problems as this ancient one. 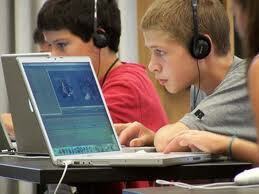 To complete this project I used the technology offered by the laptops; overall aiding in my research and in the easiness of the overall task. I hope you enjoy my project. Antigone Character Political Views: Differences and Similarities presentation. This project allowed me to investigate the movie effects available through iMovie, specifically the audio and lighting effects. I was able to use these effects and my learned knowledge of them to create a piece which accurately portrayed my tone when reading poetry allowed. I will use these tools when creating visual aids and presentations in order to get my point across when appropriate. Sometimes it was challenging to manipulate or apply the effect to have the desired impact on the audience. As we near the conclusion of year one of TL2014, we invite parents to share their thoughts on the increased access to technology. Your responses are completely anonymous and will help make the TL2014 initiative even better in year two. Thank you for taking a few minutes of your time to participate. This survey will close on FRIDAY, MAY 4. Mrs. Prokesch, 7th grade English Language Arts teacher at Salisbury Middle School, completed a unit on poetry with all of her 7th grade classes. Students wrote several different types of poems and constructed them into poetry booklets.The students in the video below wrote some of the best poems from Mrs. Prokesch’s classes. Great job students! Watch the video to see our students reading their selected poems.